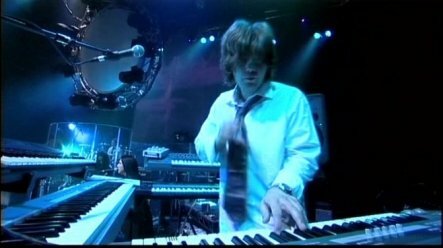 Mostly Autumn V-shows May 2004.
Review of the BBC from the Opera House, 14 May. Review by David Meadows Astoria, 8 May. Review by a fan from the Astoria, 8 May. A Review by DPRP, opens a new window. Review of 013 16 December 2004. 4th of June 2005 Astoria London . Mostly Autumn light up the Opera House a review of the BBC. Mostly Autumn are a band who hark back to rock's golden age, but create a sound all of their own. David Meadows caught them at the Newcastle Opera House on their current UK tour. "Is this band the next Pink Floyd?" 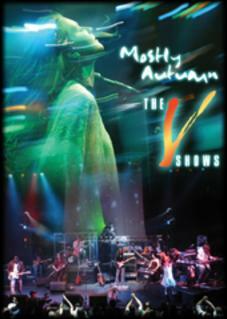 asks the promotional flyer for Mostly Autumn's audio-visual extravaganza they have dubbed the "V" tour. But while the similarities to Floyd are easy to spot, the comparison actually does the band a disservice - there are many more sides to their music. Still, it goes part way to explaining the age range at tonight's show - all age groups are represented but majority seem to be the forty-somethings who have been waiting thirty years for a band like this to come along. The seven-piece Mostly Autumn are making the difficult transition from small clubs to theatres like the Opera House, but they act like they were born to play these venues. They use the larger stage to full advantage, bombarding the audience with a visual package that includes moving projection screens, a complex and beautiful light show, and a dazzling array of lasers. The addition of a string quartet helps recreate the complexities of the songs as performed on record, but the sheer power always present in Mostly Autumn's live shows is never lost. The band themselves dominate the stage; confident, polished, and brimming with infectious enthusiasm. They play for close to three hours, taking only a short break mid-way through the proceedings. They take the unusual step of playing the entirety of their newest album, "Passengers" in the first half of the show. It's a bold move that they appear to get away with, but the second-half set of live favourites from earlier albums inevitably get the most enthusiastic crowd responses. The band promised an "audio-visual" experience on this tour and no doubt they deliver the visual spectacle, but the audio component? As their fans have come to expect, the band's performance was flawless. 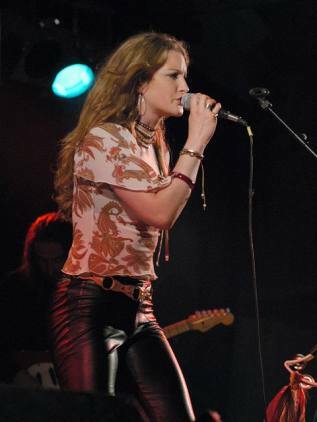 Heather Findlay's voice combines fragile beauty with a confident power, giving her the versatility to switch effortlessly from ballad to rock. When not singing or playing guitar, she's constantly whirling around the stage like the proverbial dervish with a tambourine. Her partner at the front of the stage, Bryan Josh, shares lead vocals on several songs but it's his guitar work that really shines. With stunning solos and crunching riffs, he proves himself not just a virtuoso player but a true guitar hero in the classic mould. 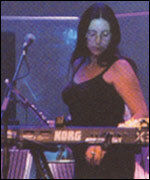 Angela Goldthorpe spends most of the show providing beautiful backing vocals and additional keyboards. 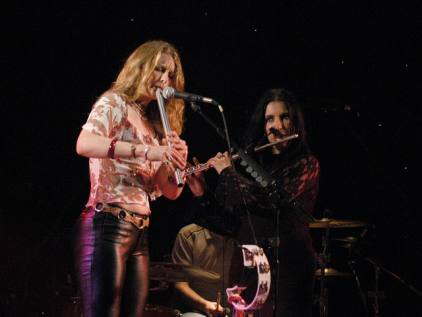 But it's with flute and whistles that she has the biggest impact on the band's sound and is a vital part of what makes this group's music unique. Her haunting low whistle in "The Night Sky" and lengthy flute solo in "the Last Climb" earn her well-deserved ovations. They seem slightly disappointed that the audience remain seated throughout the bulk of the show. But their music doesn't require standing - you can't dance to the soaring harmonies of Passengers or intricate compositions like The Night Sky. You just want to sit and wallow in the emotions that saturate each song. And if Mostly Autumn thought the audience were sitting down because they were unimpressed with the performance, the smiling faces throughout the crowd and spontaneous standing ovations should have dispelled the notion. And when, through sheer force of personality during an emotional rendition of Heroes Never Die, Josh gets the crowd to stand and invade the front of the stage, it produces one of those special live moments that will always be remembered by whoever took part. The live Mostly Autumn experience is an ever-changing mixture of sounds and emotions. One minute you're clapping along with a song, the next you're dropping your jaw at the sheer perfection of the instrumentation, the next you're in tears as beautiful melodies and heartfelt lyrics wash over you - and that's within the space of a single song! Mostly Autumn have something special to offer, and tonight they pour their hearts into communicating it. It's hard to believe that anyone in the audience went away disappointed. How can I properly describe the best concert I've ever seen? The band seemed perfectly at home on the bigger stage, without losing any of the closeness to the audience they've spent the last few years cultivating. With room to move and breathe (and dance! ), the spectacle becomes more visually interesting than it is in their usual postage-stamp venues. That's without counting their much-hyped visual effects. Because, to be honest, all the lights and lasers may have been needed to create the promotional buzz but they were secondary to the seven people on stage and at the end of the day weren't all that important. They could have left them at home and I would still be raving about how good this show was. The energy and emotion pouring off the stage was immense, and the buzz in the crowd around me echoed it — this wasn't a casual pub crowd checking out the band, this was a crowd of die-hard fans who clapped and sang along with every song. A great atmosphere and, although I thought seated venues suited this band better, the all-standing venue seemed to help the atmosphere tonight. And did I mention the place was packed? Set list: very unusual. The first half of the set was Passengers. All of it, though not in order (starting with the suitably rocky Caught in a Fold and ending with the intense, uplifting Passengers) An interesting approach — not one I would want to see every tour, but it worked well tonight. I'm not going to give a song-by-song account but there wasn't a bad one in the bunch and most were exceptional — lifted far above the album arrangements. And of course the format meant we got several songs I've never heard before. Some words about individual band members, all "dressed up" for the occasion. They make the most of space on the stage by moving all over it, taking turns to come forwards to play for the audience, and closely interacting and feeding off each other's performances. Just like a real rock band! They all seem excited and happy (and even, dare I say it, proud) to play for us, and that's the most important element of any gig, really. Andrew Jennings impressed me immensely. In just a few weeks, he's gone from being (in my eyes) "pretty good" to being a virtuoso drummer. I love the syncopated drum pattern he adds to (for example) Mother Nature — it suddenly brings the drums to the front and makes them another instrument in the song instead of "just" providing the rhythm. Stunning. And while I miss the powerful crescendos that Jonathan Blackmore brought to songs, I'm more than happy with the new guy's approach. Heather sings beautifully throughout, as good as I've ever heard her, but I don't want to ignore the (often ignored) vocal contributions of Angela Goldthorpe, who gets better (or at least more noticeable) with each new gig. As long as she continues to sing like this, I'll forgive them for never playing Which Wood? any more. The closing section of Simple Ways where they wail in harmony... well, just, "wow". Back to the set. A ten minute break then they come back for the second set, opening it with The Night Sky. I don't think I've heard it since the Story So Far gig (downstairs at this very venue three years ago) so it was a nice surprise. After this it was the predictable classics — predictable in a good way, of course. I'm sure everybody could name at least one "essential" song they missed but I think it was worth the sacrifice for the novelty of hearing everything from Passengers for the first time. Only the encore was a surprise — a new song? It's good... but the arrangement seemed a bit chaotic. Is that because it hasn't "worn in" yet? I'll refrain from saying more until I hear it again next week (?). You'll notice I've said nothing about the guest musicians. That's because my main thought was... why are they there? Oh, they were good, no doubt about that. Troy Donockley is a marvellous musician and I adore the sound of the lowland pipes. And the string quartet did add a new layer to the few songs they appear on — but that's the key: "few". None of the guests feature on more than three or four of the 20 songs played tonight. It seems a lot of effort to bring along all those guests then under-use them. At the York show last year, the set seemed much more "built around" Donockley, the strings, and the choir. Here, it seemed to be more of a case of squeezing the guests into an already-decided set that didn't really need them. Don't get me wrong — there was nothing bad about the inclusion of the extra musicians. It just seemed like wasting an opportunity to do so much more. And one final quibble before I finish: yes, the lights were beautiful and lasers shooting through the crowd are a great effect, but some of the laser effects seemed poorly thought out and didn't quite gel. It felt like seeing laser "clip art" — pre-packaged embellishments added as an afterthought "because we can". Probably should have resisted the temptation to use them. But none of that detracts one tiny bit from the quality of the music and the performances. It truly was the best concert I have ever seen. Do you know how good they are? To David Meadows Site with more reviews. Just got home from the Astoria 'V'show. And what a show it was. I managed to grab a place right at the front which put me halfway between Heather and Iain. We were expecting the band to be on stage at 7:15pm but they began the first Set at around 7:20. Kicking off with "Caught In A Fold", the stage sound was superb from the first note. Heather's vocals were strong and distinct and she looked... well she looked totally enchanting. Her warmth; her passion for the song and the meaning behind it, her every expression and posture must rate as some of the best stage craft I've ever witnessed in all my years of gig-going. But let's not forget the other band members. Angela looked stunningly serene in her familiar all-black. Barefoot, she ventured to stage front every so often during her exquisite flute parts and seemed the perfect opposite to the rough and ready, earthiness, of Bryan. Liam was Liam - exactly how you see him on the DVD's - deeply into his music; occasionally checking his tuning; almost static that you'd be forgiven in thinking he'd fallen asleep until he suddenly decides to stroll to the front and look out at the crowd with a twinkle in his eye before returning back to the safety of his Marshall stack! Iain & Andy, not a note wrong all night (and if they did they got away with it!). As for new drummer Andrew, what a learning curve he's had to endure these past few weeks but he's doing OK, although, I would say the size of his drumkit looks a little sparse for a powerful band like MA and I did miss some of the more exciting drum fills that Jonathan would have attempted on his more equipped kit. And then of course there's that other bloke, old whats-his-name.... Mr Josh. He was having a ball and getting some top notes from his Strat' that I didn't think were possible! He's a great guy though, so at home up there surrounded by his songs and the band he's created from that dream he had all those years ago. You just know you'd feel comfortable sitting with him having a pint and chatting about everyday stuff! And like his visual contrast to Angela so his modern rock guitar contrasts with centuries-old instruments like flutes and bodhrans and whistles and that's what makes this band so interesting to watch and listen to. Their diversity. A re-working of the first verse & chorus of "Somewhere In Between" provided great light & shade to the song which returned to it's normal tempo and power at verse two. Very effective I thought! Bryan went on to tell us that the whole of the "Passengers" CD would be played in it's entirety in the first Set and the second Set would return to earlier material. But he could have told us he was about to play a cover of "Agadoo" and we'd have still lapped it up, knowing it would have been given the full-on, 'MA treatment! There was a real buzz in the crowd tonight. The much-awaited 'V' shows were finally here and they were exceeding their expections! The projections were very effective, particularly during Bryan's "Heroes Never Die" with images of his father and forefathers (I assume) displayed on a large circular screen supported above the centre of the stage. 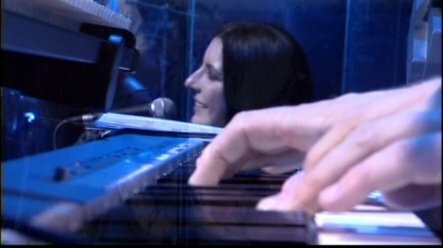 As the song drew to a close I noticed Bryan and Heather gazing up at the images and he motioned to the band to draw out the ending until the final image of his father was displayed. Quite moving and a fitting tribute. 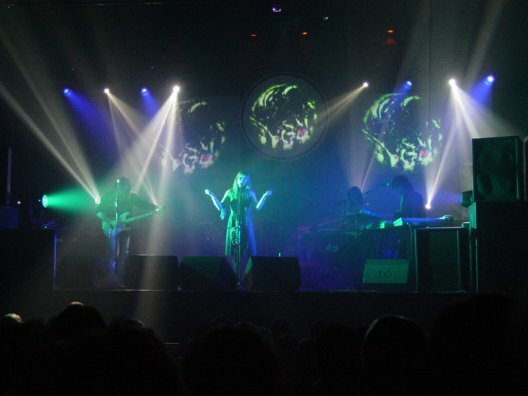 This particular 'V' gig had the added benefit of a laser light show and it was amazing to watch as the green beams were projected out into the audience and across the band. It's a shame they can't be set up at the Newcastle and Wovlerhampton shows as they did add another aspect to the proceedings. But of course it's the music and the band we really want to concentrate on and Set Two opened with that great song, "Night Sky". 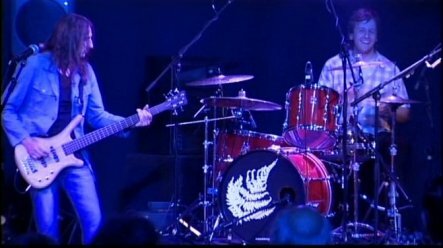 I always find Heather's interpretation of that song, particularly the eagle flying through the night, very captivating and Bryan's solo was, again, superb, as he wrenched every emotion out of his guitar. Standout track for me though had to be "Evergreen". It rocked and then some! The volume had been increased from the first Set and "Never The Rainbow" had to be the fastest version I've heard to date. Poor Heather was out of breath at the end of it! 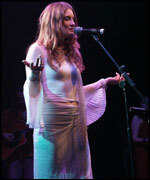 "Spirit Of Autumn Past" was performed and, of course, a perfect "Mother Nature" closed the Set. Unfortuntely, the Astoria has a 9:45pm curfew and the band had little time for encores. They did, however, managed to squeeze one more song in. For me though, this was the only quibble I had all evening. They chose to play a cover (which is quite customary with them) only this time it was the old Genesis track "Ripples" (if my memory serves me right!). A lovely song but... I dunno, something didn't sound right in some parts, almost as if one or more of the band were changing into the wrong key. I saw Troy lurking in the shadows backstage and he seemed to be grimacing as if he'd picked up on it. The band will sort it out I'm sure - just a little more rehearsing, but I would much rather have seen them perform one of their own, many beautiful, pieces of music. Songs I'd hoped they'd play left til another day... "Winter Mountain"; "Shrinking Violet"; "Darkness Of The Dawn"; or any of their jigs! But I came away a happy man and so were my three guests with ages ranging from 15 to 61 ! MA = Music for All ! Great gig guys. Good luck with the final two and hope to see you back down this way in the not too distant future. Good heavens - it's 2:40am - time I went to bed and repalyed the show in my head! I'm sure someone else will point this out before me, but the images projected during "heroes" weren't Brian's "forefathers" but his actual real life heroes. A varied bunch including (and I'm sure there's a competition here somewhere! ); Dave Gilmour, Beethoven, Martin Luther King, Ritchie Blackmore (and the rest of Deep Purple), Charles Lindbergh, Churchill, Robert Plant, Nelson Mandela etc etc. finishing of course with Robbie Josh. The unpredictable last track was, I think, the end section from the Genesis epic "Suppers Ready", [Nick: it was Afterglow] and I agree it was a bit ropey early on but finished with huge power. Great gig though!!!!!! 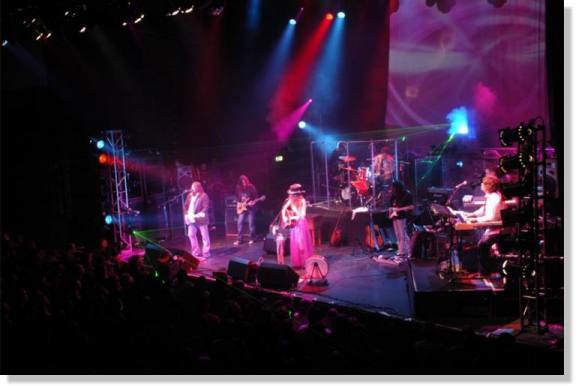 The powerful music of Mostly Autumn and the stunning audiovisual elements combined to produce a series of magical evenings at the London Astoria, Newcastle Opera House and Wolverhampton’s Wulfrun Hall. 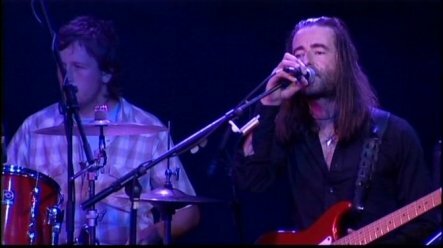 These amazing shows were widely hailed by Mostly Autumn fans as the best ever performances by the band. This new double DVD release features both sets. This is the complete film of an important evening in the continuing development of a truly amazing band. Both discs have been mixed and mastered for 5.1 Surround Sound and come with DTS encoding. This 2 DVD set is presented in the same high quality hard back book format as the previous limited edition York opera DVD. The York set is now a highly collectible item much sought after by new fans. Why only mail order?? Mostly autumn will be releasing a new studio album in November. We need to keep the retail trade focused on the marketing campaign to help sales of the new album. As a result this double disc set will not be available in the stores. It is offered by mail order only in a strictly limited edition of just 2000 copies. 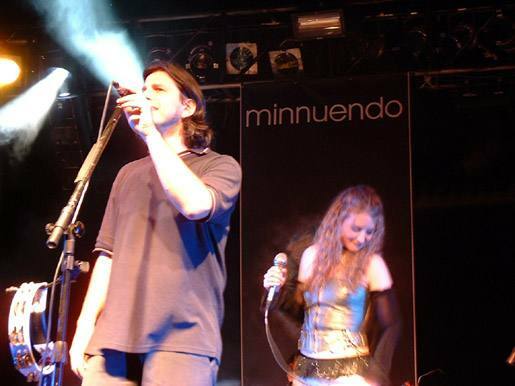 Picture of one of the latest U.K. gigs November 2004 by Thijs. the Dutch Mostly Autumn site. More info about the New Lowlands Tour 2004 including a Pink Floyd set. Wednesday 15 December : Schouwburg C.C. Luchtbal. www.ccluchtbal.org Antwerpen promoted by www.prog-nose.org. Thursday 16 December : 013 Tilburg www.013.web.nl. Friday 17 December : de Boerderij Zoetermeer www.boerderij.org. Saturday 18 December : de Kade Zaandam www.kade.nl. Updated 06 December 2004 by Nick.